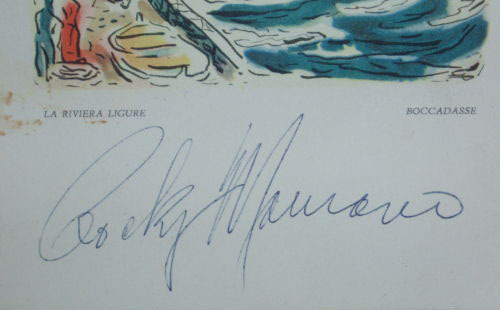 Some time ago we made the collectors of boxing autographs aware that a company called PSA/DNA is authenticating an autograph of heavyweight champion Rocky Marciano that is actually an autograph of middleweight champion Rocky Graziano click here. 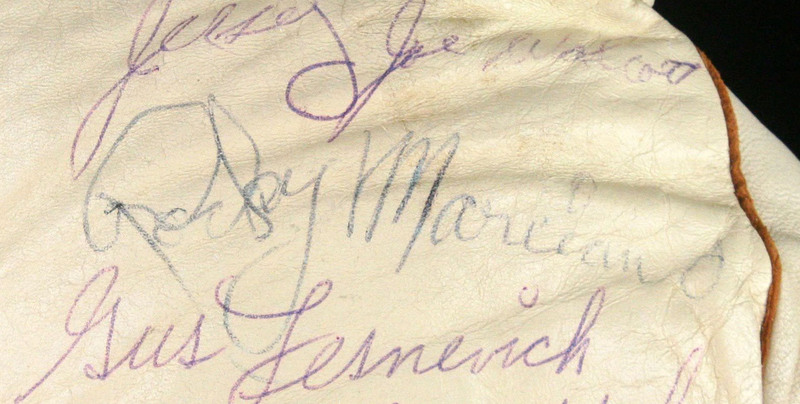 Are they now authenticating two autographs of Rocky Marciano which have no supporting evidence at all? Do collectors of boxing autographs with even the slightest bit of experience need to think twice about these? Slow, child-like writing, atypical letter formations, the "ky" in "Rocky" changing direction and slanting upward? 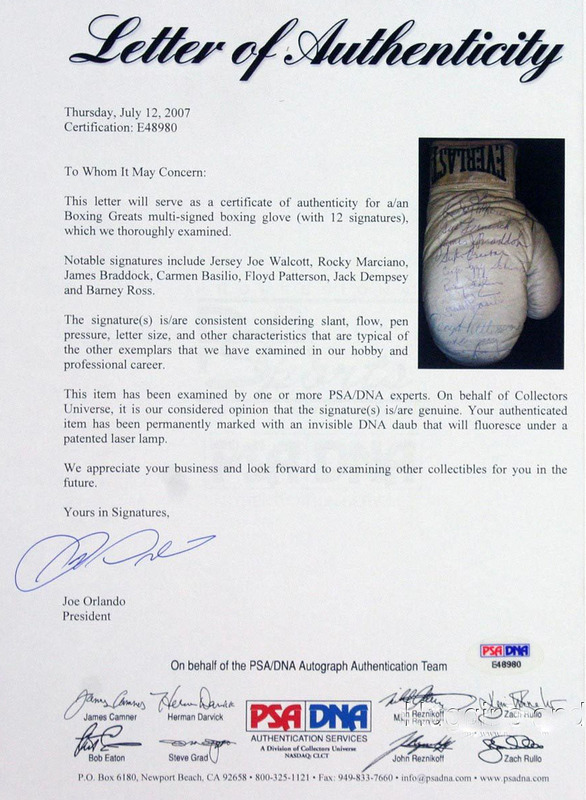 The PSA/DNA letters are signed by a guy named Joe Orlando who is listed on the PSA/DNA web site as the "president" of the company. 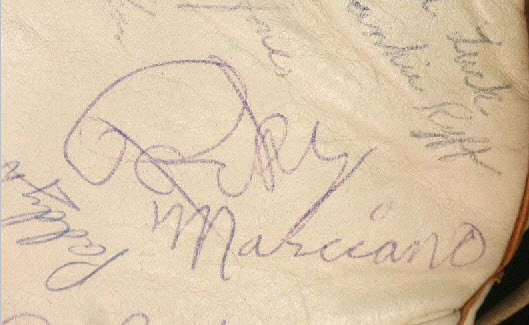 Does Joe Orlando have any supporting evidence/exemplars to support these two Marciano autographs? If he doesn't have any supporting evidence/exemplars what are we to assume? Does this company add false value to non-authentic items? In all fairness, this web site will post any supporting evidence Joe Orlando cares to supply. We watched an honest autograph dealer auction off this Charley Goldman signed postcard (below center). 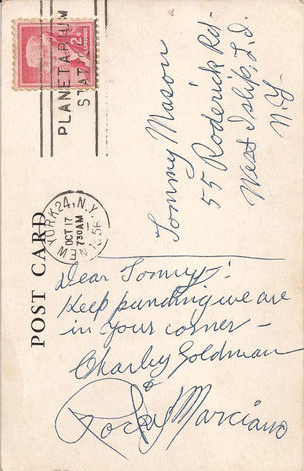 The dealer listed it as a postcard signed by Goldman, Marciano's trainer, with the Rocky Marciano not being authentic and most likely a mimicked signature by Goldman (we agree). After comparing the PSA/DNA signed Marciano gloves to 350 Marciano exemplars this is the only example we could match it up to. Notice the signature of Goldman and Marciano on the postcard above, postmarked Oct 17, 1956, are both signed in the same ink? 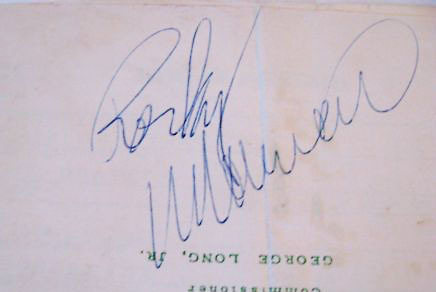 Below are two examples of what we would consider to be legitimate 1956 signed Rocky Marciano autographs. The one on the right a bit more rushed than the one on the left. Does the signature on the postcard look similar to the two legitimate examples below or do they look quite different? 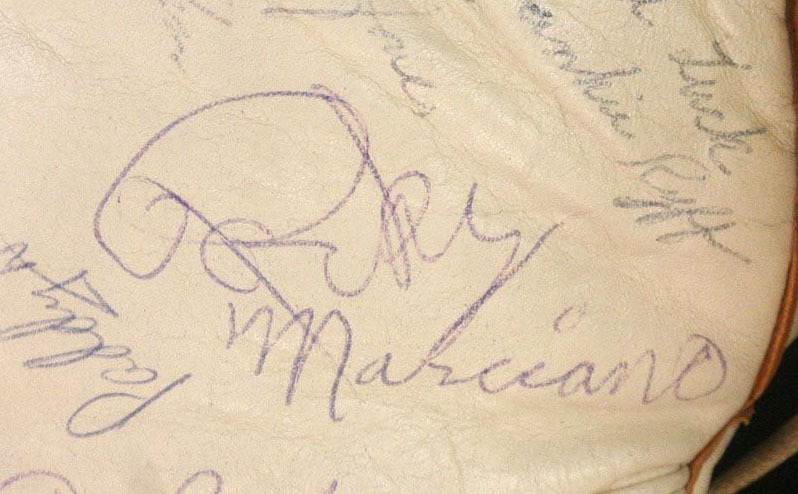 If Marciano didn't sign the postcard and the postcard matches up perfectly to the PSA Marciano signed gloves, did Marciano sign the gloves? 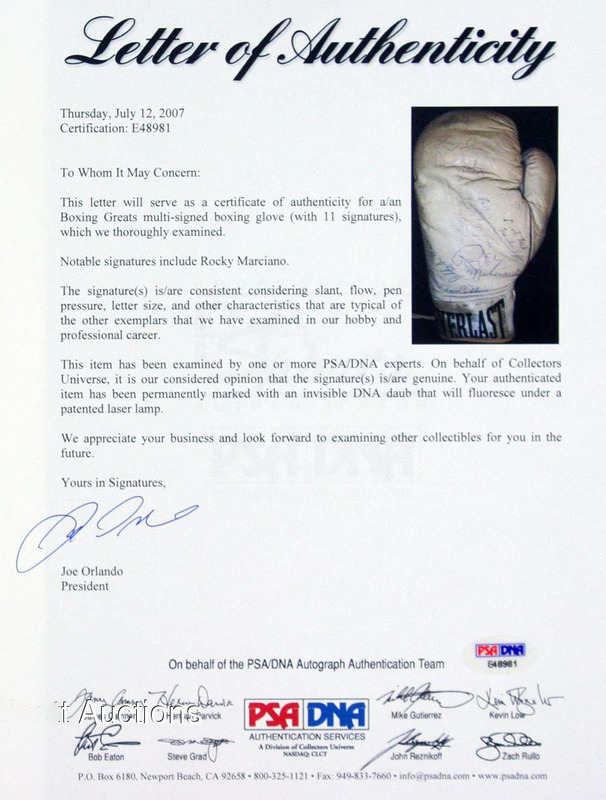 Below is an example of what we would consider to be a legitimate item signed by both Charley Goldman and Rocky Marciano.